Ames, Iowa (CNN) – A day after a debate that saw much of the GOP field gang up on front-runners Mitt Romney and Newt Gingrich, Rick Perry largely avoided the debate's big issues while continuing his Iowa push Sunday afternoon at Café Diem in Ames. Although Perry is clearly making a big finish in the first caucus state a key part of his campaign strategy, he chose not to pander to the local crowd. "I'm for pulling all of those tax credits, or subsidies or however you refer to them out of the energy industry," Perry said. "Whether it's ethanol, whether it's oil and gas or what have you, the market will decide where to go. I am not worried in the least that Iowa farmers [will suffer], if we'll get the EPA and regulations out of their business." But his attempt to turn this tough talk into an attack on the current administration came with a few of the verbal misstatements that have plagued other public appearances by Perry. While criticizing President Barack Obama for picking winners and losers in the energy industry, he bungled the name of the most famous energy company to go under despite government assistance. "No greater example of it than this administration sending millions of dollars into the solar industry, and we lost that money," Perry began. "I want to say it was over $500 million that went to the country Solynda." Solyndra, a company which manufactured high-tech solar energy panels, went bankrupt this year after receiving $535 million in federal loan guarantees. 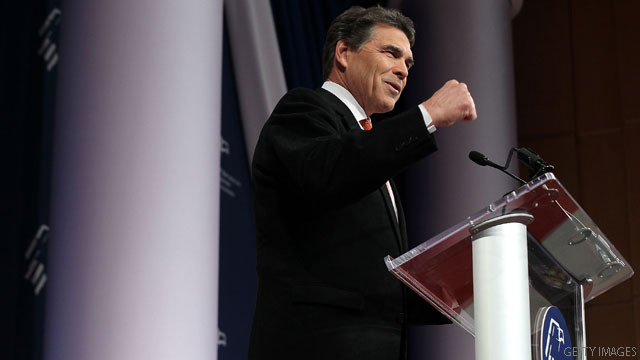 As he left the stage, Perry was confronted by several hecklers scattered around the room. The closest was Warren Blumenfeld, who teaches a gay studies course at nearby Iowa State University. Blumenfeld got quite close to the governor while yelling, "Why are you marginalizing people in this country? Why are you demonizing gay and lesbian people?" Perry ignored Blumenfeld's shouts as he signed autographs and moved toward the rear exit of the crowded Ames coffee shop. As the crowd began to drown out Blumenfeld with applause, a man in the back of the room also began yelling about Perry's opposition to gay and lesbians serving openly in the United States military. "Why can't gays compete in the military?" yelled 24-year-old Marine Corps veteran Jason Arment. His calls for openness in the military attracted some jeers and retorts from members of the crowd nearby, but were largely ignored by Perry. Perry is trying so hard to look like a tough hombre, chest puffing,.. he looks like a stiff cardboard cutout on stage. I think when the Lord called on Perry to come forth for brains,.. he came fifth. Nothing is more pathetic than an irrelevant "candidate" searching for that single, social issue that he thinks will make him relevant again. Perry deserves our pity, not our votes. Perry is a dimwit , and when is he going to know it's OVER for him ? the good thing about Perry is his campaign is keeping him OUT of Texas. He's done enough damage here and to the image of our state as well. Perry is very relevant....and that is what concerns those that don't want him to be..just sit back and continue to watch the show!! I was born in Iowa. Lived there until I was an adult. Many, many wonderful people. I just can't believe that they would be taken in by a candidate of Perry's ilk. Or any of the present crop for that matter. The GOP is not the party it once was. Homosexuality is an action that is abominable. Its not the same as race or gender. Notice that most cases in the news about peodophiles; whether priest or coach; has to do with homosexual acts on little boys. Is this an offshoot of the muddling of this issue? Are some educating themselves into imbecility. I'd be ashamed if if I lived in Texas... this is their reprresentative?!?!?! Go home Perry, President Bush's political machine has killed your presidential asperations. The Bush Machine is too powerful and you should have known that. Why didn't you schedule a meeting with George Bush and crawl in on your knees and begged him for his help. Now it is too late. Go close three fast food joints in your neighborhood; McDonalds, Burger King and that other one. What's the other one......Opps. So, thanks Governor Perry for standing up for Christians. Your ad caused quite an upoar, and it is good for America to see from the Reacton of Outrage how Satan and his Dark Forces are in Control of the Destiny of our once Proud Union. Now we can watch for ourselves to see Satan rise up and further attack Christianity, and Morality. No wonder our country is over run with crime, lack of responsiblity, drugs, and the proverty of no discipline. Perry is just one sick Christian. Thank God not all of us are like this fruit cake and half of the other 7 running! That's the trouble with religious bigotry......it catches up with you.